This post is sponsored by VISIT FLORIDA. 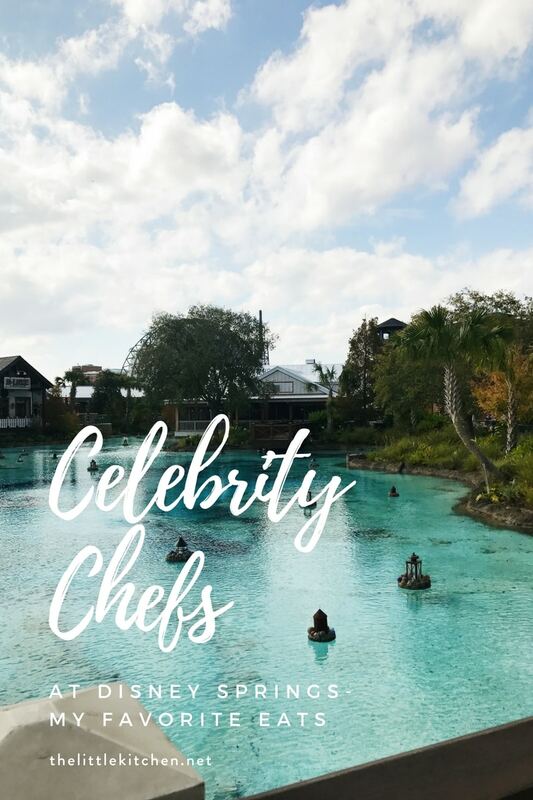 Last month, we had the opportunity to spend a weekend at Disney Springs and explore what the celebrity chefs have to offer. I’m so excited to share with you our experience. Disney Springs is an entertainment, dining and shopping complex. It used to be called Downtown Disney and if you haven’t been in the last few months or the last few years, when you go again, you’ll notice HUGE changes. There’s plenty of parking in the new high tech garages (each row has a sign above it to tell you how many spaces are available, I wish airports would add this to their parking garages) and there’s plenty of space to roam around and explore. 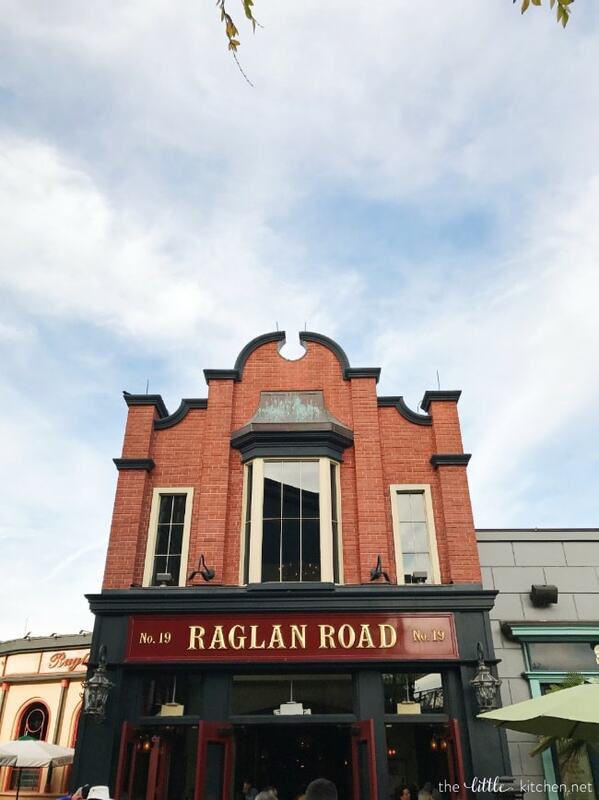 First up, the authentic Irish pub, Raglan Road Irish Pub, owned by Irishmen including Chef Kevin Dundon (who has a show on PBS) and has been at Disney Springs for a remarkable eleven years. 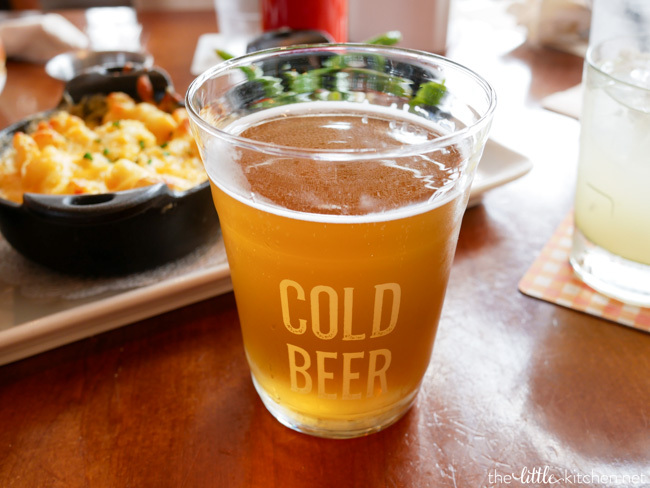 Raglan Road is one of our classic favorites at Disney Springs. Chef Kevin relishes in using the best ingredients he can find and allowing the ingredients to shine. My husband, Curtis, and I love going to the pub for dinner or hanging out at the bar to check out the traditional Irish bands and dancing! 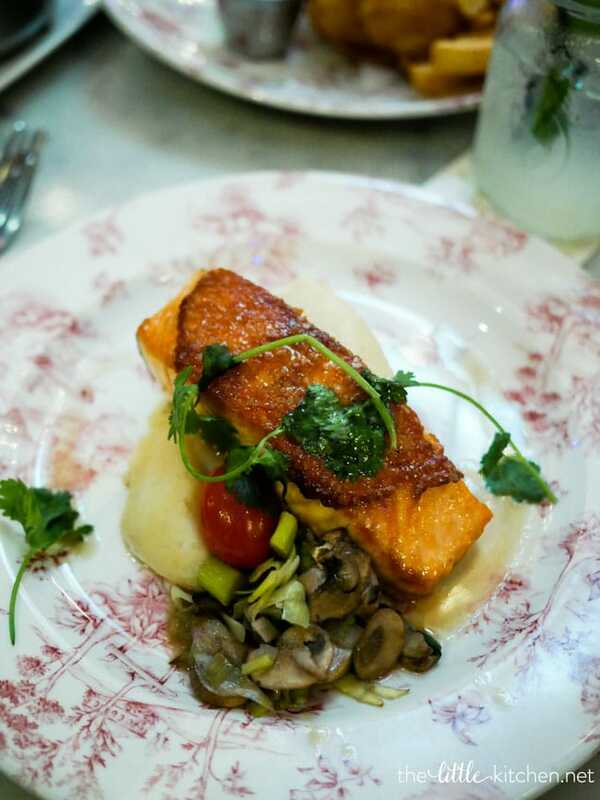 I had the Salmon of Knowledge, which is a baked Atlantic salmon topped with smoked salmon and served with mashed potatoes, leeks and mushrooms. Curtis ordered the Braised Beef. 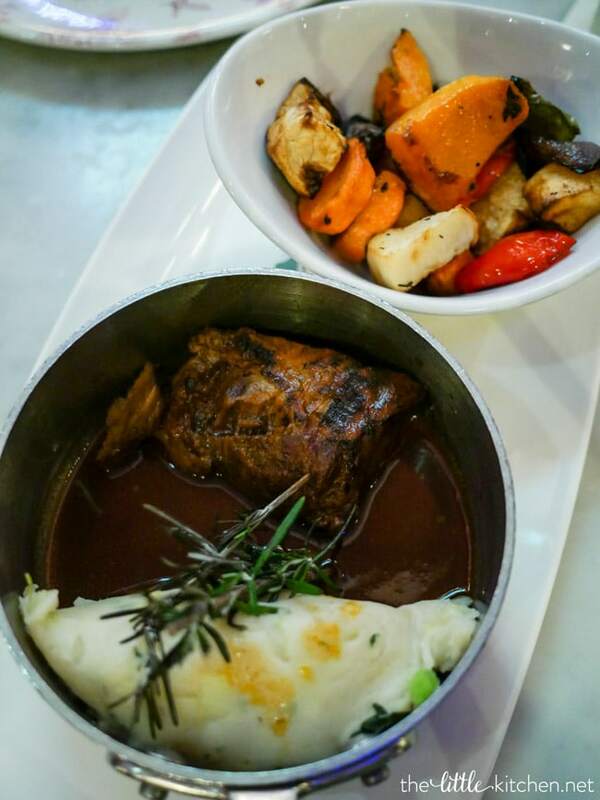 The beef is braised for seven hours and comes with traditional Irish potatoes that were out of this world! Curtis still talks about this dish to this day. 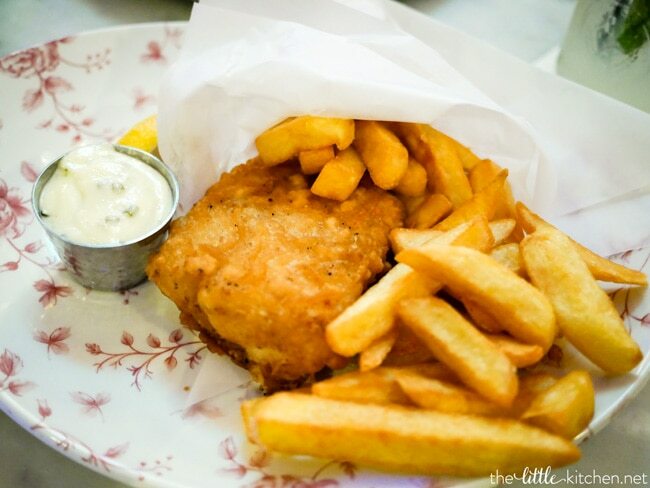 The fish and chips are always our favorite. The fish is beer battered and they serve it with a fresh tartar sauce. By the way, I love their skinny truffle fries too! 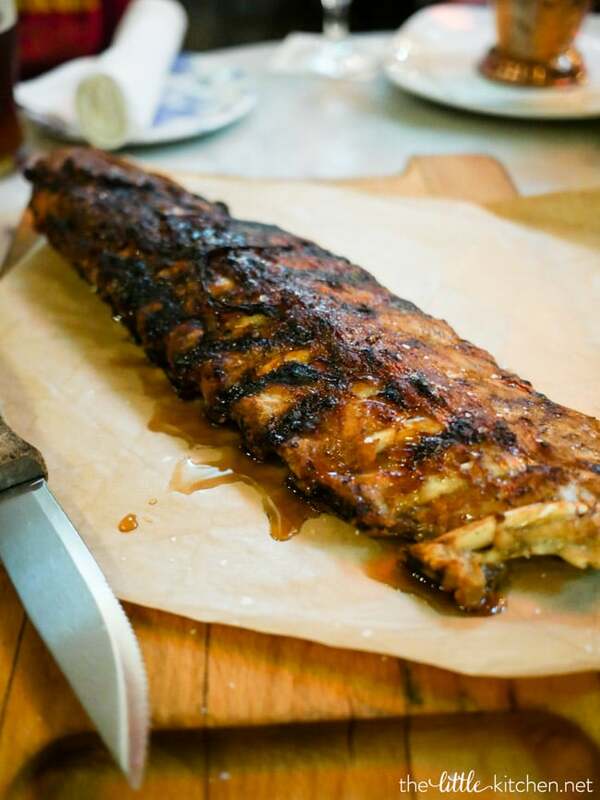 You have to get the Rack of Heaven, slow roasted ribs glazed with Guinness beer. I talk about these ribs. all. the. time. Curtis loved them too! 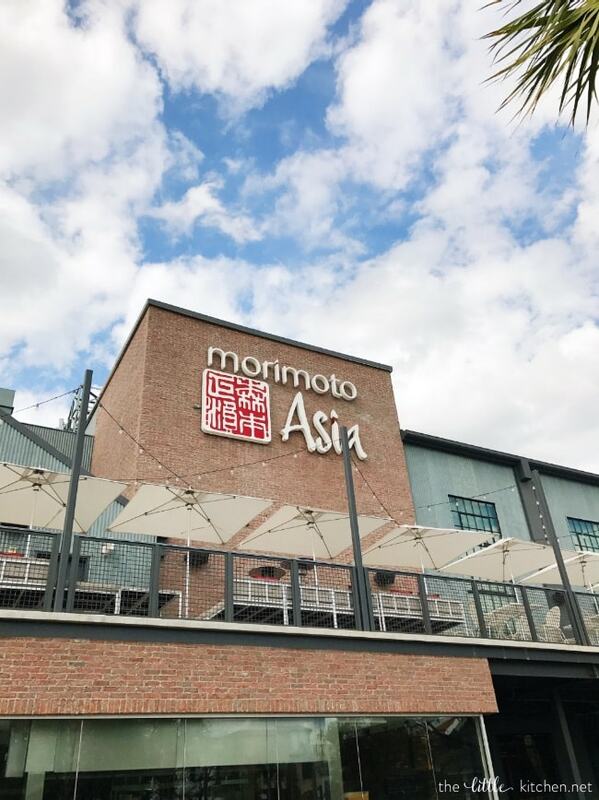 Next up, Morimoto Asia. Do you know Chef Masaharu Morimoto from Iron Chef fame? 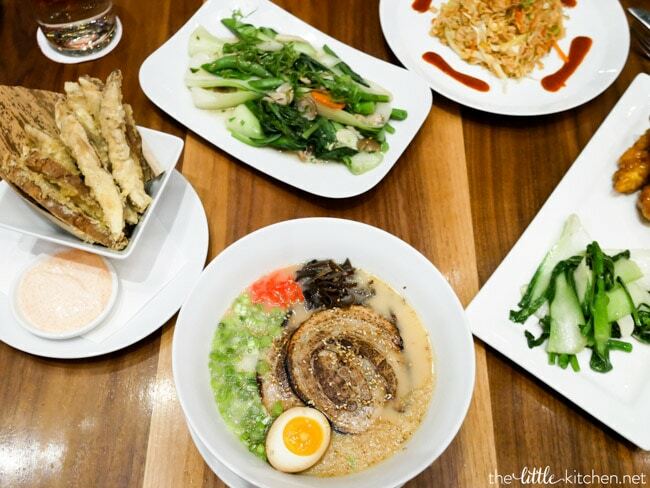 This pan-Asian restaurant has traditional and American-ized Asian dishes the whole family will love. From the Peking-style duck to the orange chicken, we enjoyed it all. The decor of the restaurant is modern chic with a rustic backdrop, I wish it were the decor of my house! 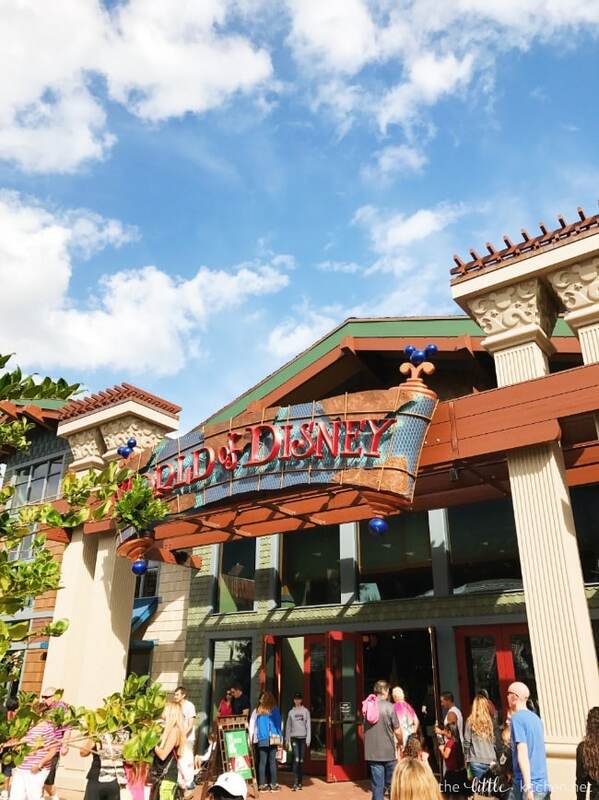 The restaurant is in the so-called Disney Springs Bottling Company, as the Disney story goes. It’s a really cool building with an upper level lounge that has its own entrance at night and offers a full sushi bar. 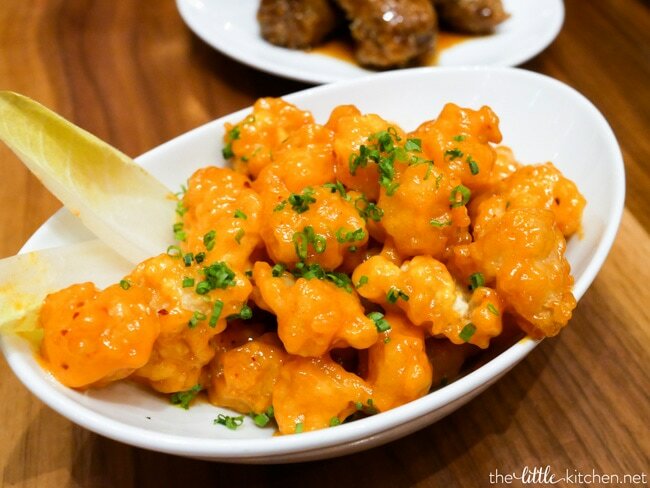 This tempura rock shrimp with a spicy gochujang aioli was one of my favorites. You have to get the hoisin glazed Morimoto spare ribs too. I have to get them every single time I go! I also had the Tonkotsu ramen and the tempura portobello mushroom fries, so clever and lovely! I’m craving this as I write this! 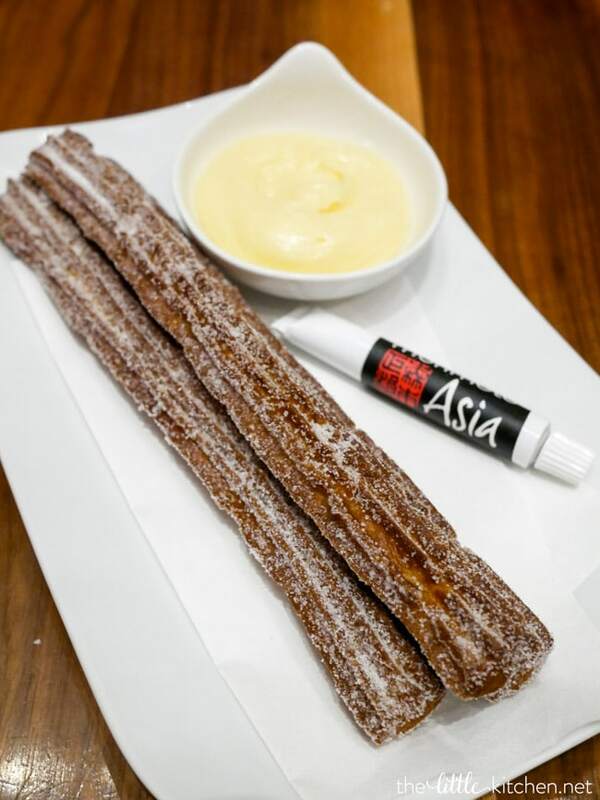 I attended a press event when Morimoto Asia first opened last year and Chef Morimoto said he had to include churros on the menu because it’s so Disney. These are the best churros I have ever had. 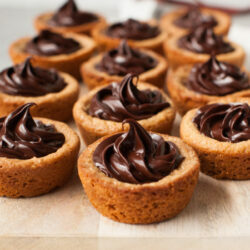 With the perfect amount of crispy and softness inside, they are a perfect ten! They come with a vanilla custard and a tube of housemade Nutella too. You won’t be able to say no! 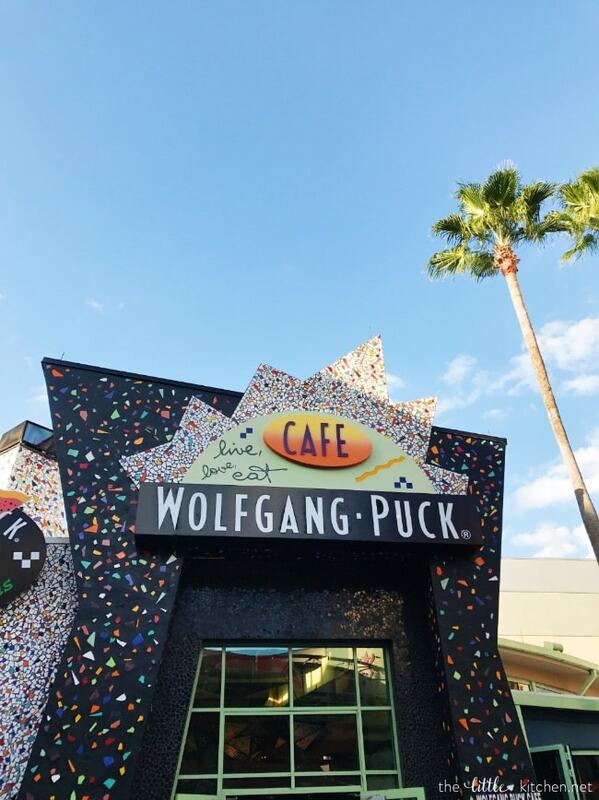 Our next stop was, Wolfgang Puck Cafe, this was the only restaurant we had never been to. We were really impressed with the food and the service. 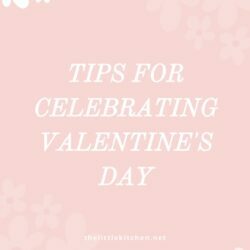 And pro tip for you: the Dining Room is where we ate has a great view of the lake at Disney Springs and of the holiday drone show called Disney Springs Starbright Holidays. Be sure to ask for a table near a window facing the show. The seasonal charcuterie board is one of my all-time favorites. 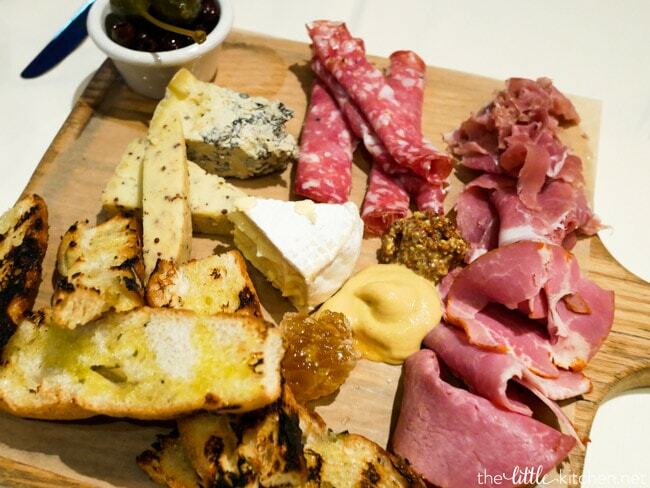 The meats were carefully selected and the cheeses are just perfection. 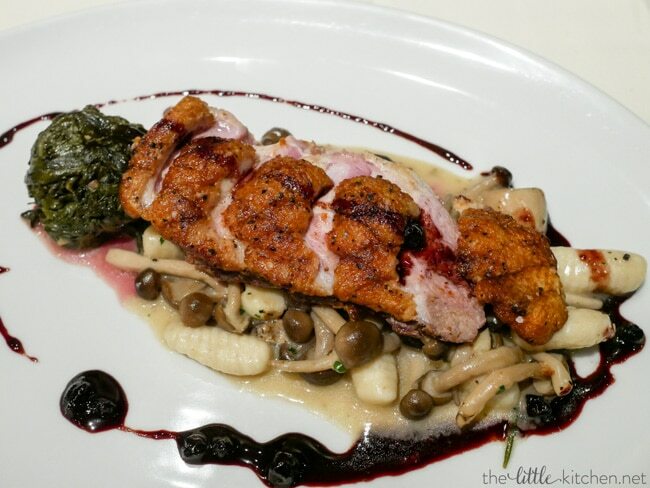 For dinner, I ordered the roasted duck breast with mushrooms & ricotta gnocchi. It was beautiful, tasted tender and crispy and the duck was perfectly cooked! 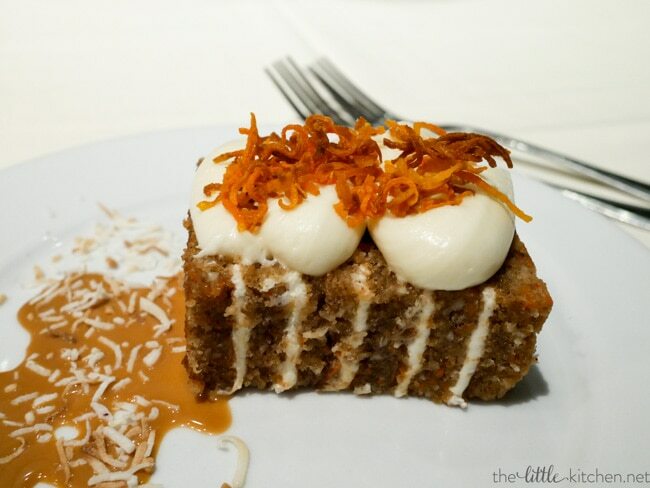 For dessert, we enjoyed a non-traditional carrot cake. Layered between the cake was a coconut cream cheese frosting. Even more cream cheese frosting and crispy carrot flakes on top! The next restaurant we visited was, Chef Art Smith’s Homecoming Kitchen and it feels life Florida when you walk through the door. It’s Florida comfort food and I love it! Chef Art Smith is a jovial and down to earth chef who really cares about where his food comes from. He’s funny and likes to share stories about growing up in Jasper, Florida. The restaurant is called Homecoming because he’s coming back to his roots and it speaks to his deep roots here in Florida. In the back of the restaurant, there is a huge portrait of a featured farmer and his or her family. The farmers featured are rotated seasonally, and I love that they showcase the farmers they source their food from. 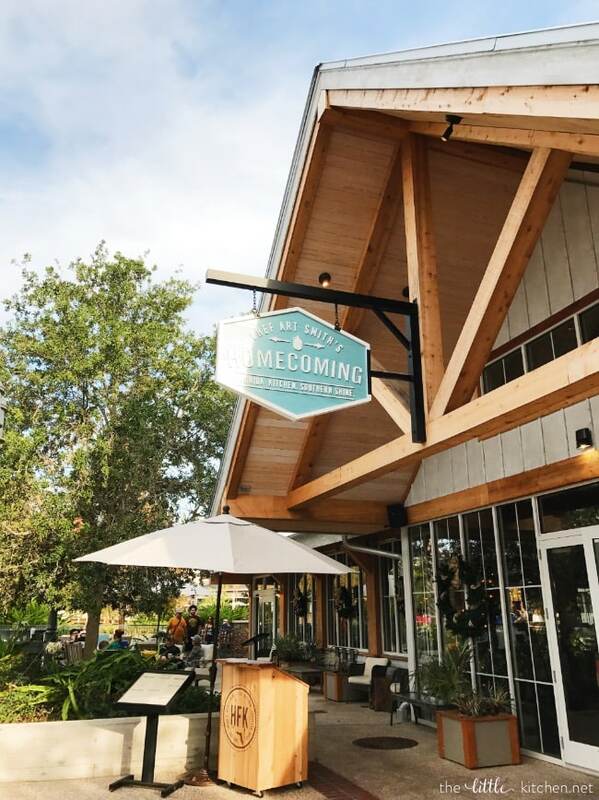 I learned that Homecoming is a true farm-to-table restaurant that strives to use as much local food as possible. At times, as much as 70-80% of what they use is from local sources. 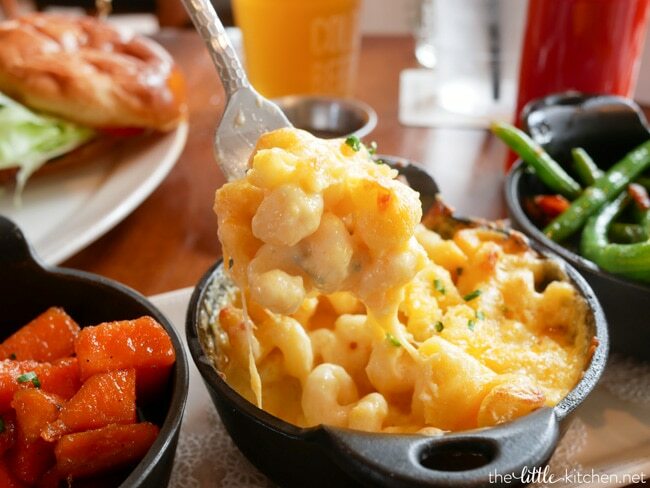 We opted for a Sides Sampler, which features Homecoming’s signature Momma’s Mac and Cheese. I’m hoping I can get the recipe from Chef Art. Fried Chicken & Doughnuts, need I say more? The fried chicken is topped with powdered sugar, which makes it pop! Served with housemade sugar doughnuts and mashed potatoes and gravy. This meal is so comforting. 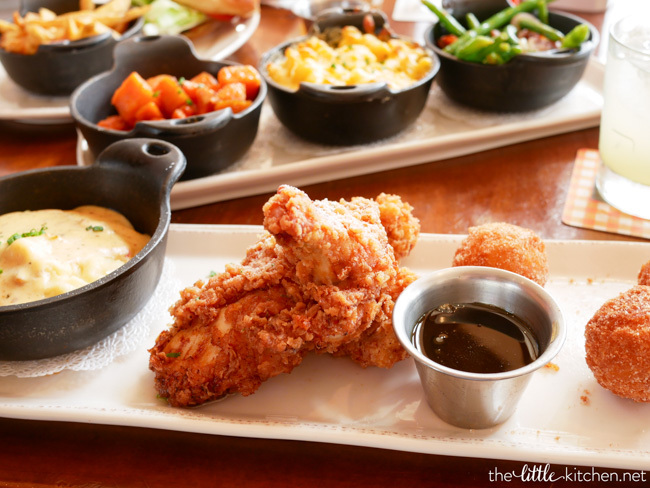 Also, I suggest getting the pimento cheese hushpuppies and the Church Lady Deviled Eggs. You will thank me! Make sure to check out their cocktails as well. The service from the bartenders really makes you feel at home and I loved how they were able to make alcoholic drinks into mocktails too. I suggest trying the Bootlegger cocktail as a mocktail. They also carry local beer, which Curtis loves! We had to get the chocolate cake. It comes with vanilla ice cream that’s locally made in my hometown of Winter Park. 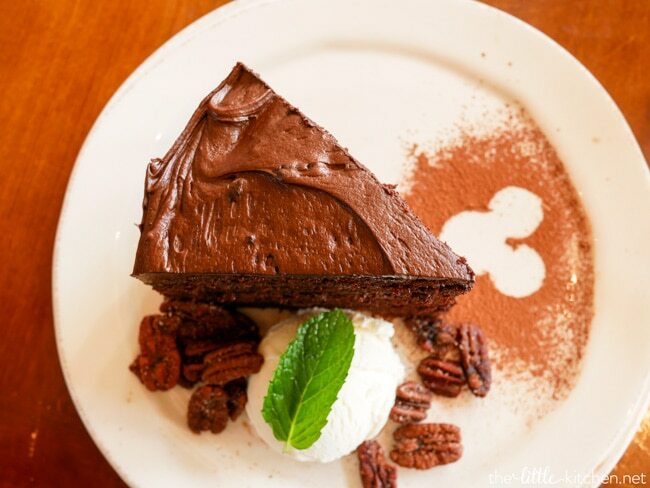 The ice cream and pecans add a nice balance to the cake! The chocolate pecan pie is also killer. Yes, I know I just made your dessert decisions that much harder. Last but not least Chef Rick Bayless’ Frontera Cocina. I need to tell you about my anticipation for this restaurant. I have eaten at his Frontera Grill in Chicago so I was so excited when I saw the announcement for this restaurant last year. This restaurant provides delicious and authentic Mexican food. Okay, of course I had to have a margarita! Their watermelon margarita to be exact. 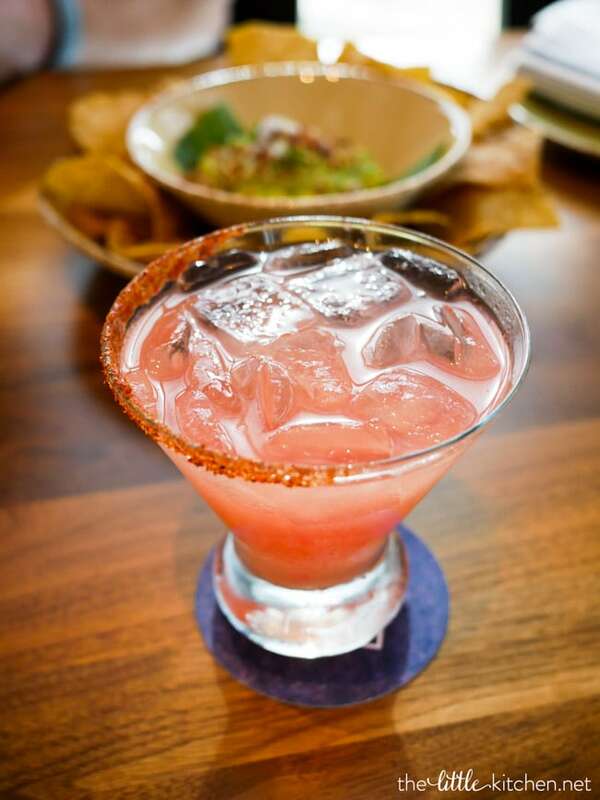 The watermelon margaritas feature a tequila and an orange liqueur with watermelon and lime juices. It’s very refreshing and a perfect cocktail to enjoy with Mexican food! Frontera Cocina’s guacamole with bacon and pistachios was so delicious that I’m going to have to try my hand at a version at home. 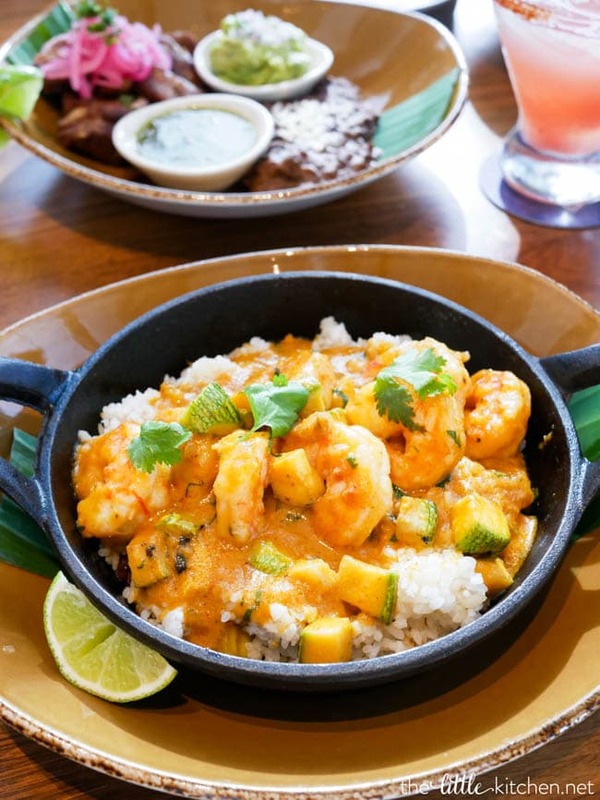 The Shrimp Mojo de Ajo is served with Mazatlán blue shrimp and dreamy plantain rice. Truly, I dream about that rice. 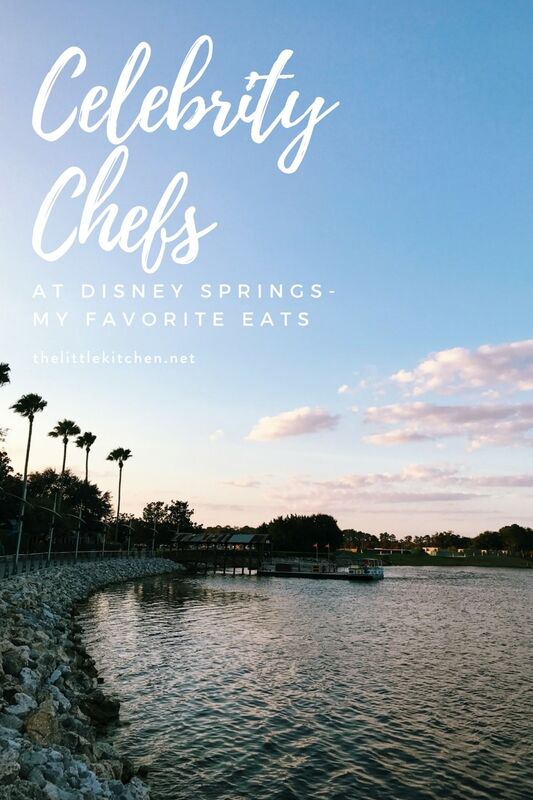 Disney Springs adds so much to the central Florida food scene and we will certainly be returning to all of these locations. 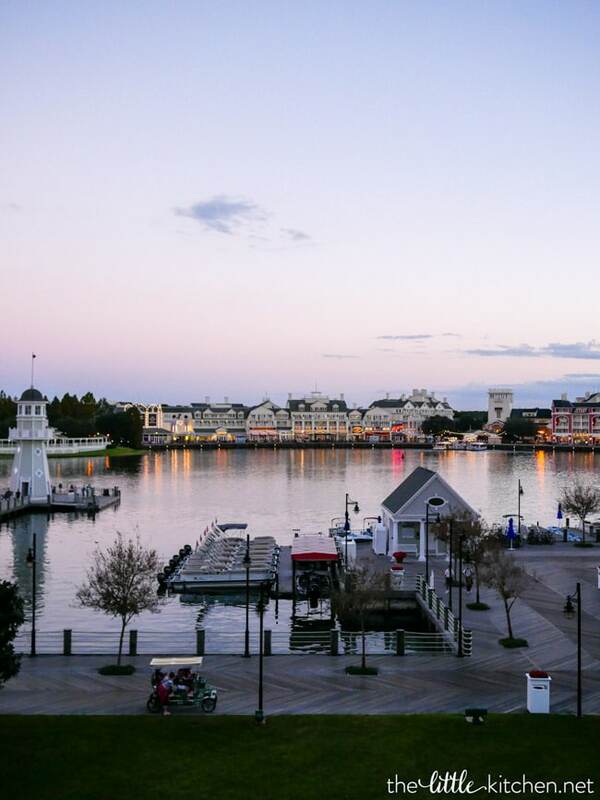 Walt Disney World offers many hotels which are just a quick bus ride away from the parks and Disney Springs. 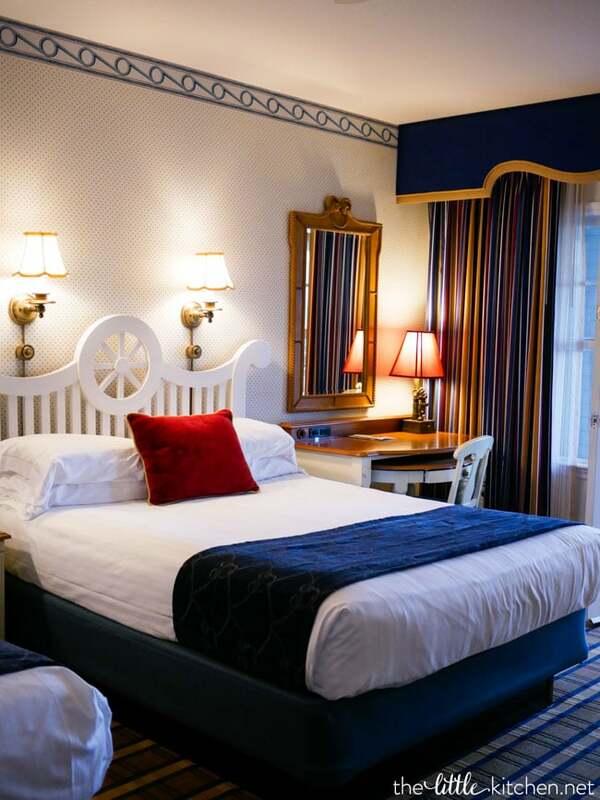 Guests love to stay at Saratoga Springs because Disney Springs is a just a walk or boat ride away. Saratoga Springs was full during this visit, so we gave Disney’s Yacht Club a try and definitely have a new favorite to add to our list. 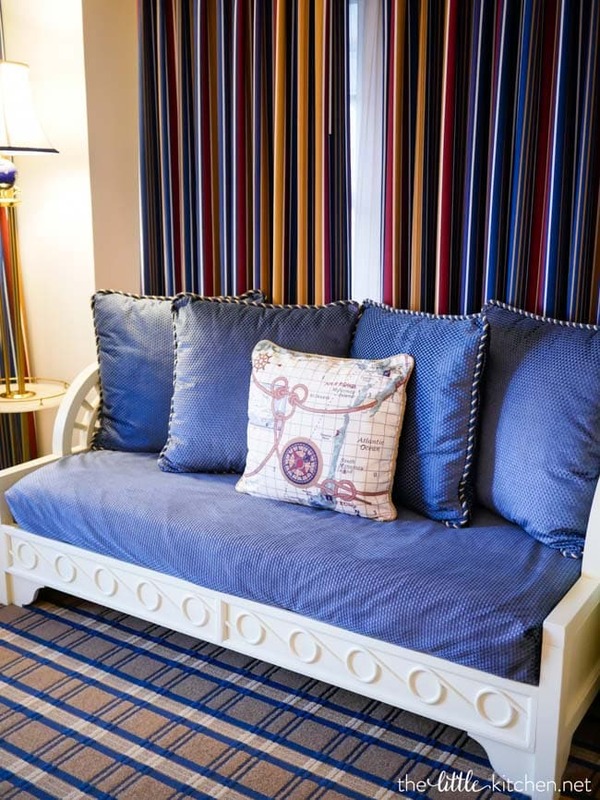 The nautical decor perfectly combines Walt Disney World and the sea. Our view outside our balcony of the Boardwalk was spectacular. It was an easy bus-ride over to Disney Springs and we love that the bus stop at the resort features a TV screen that tells you the estimated arrival for buses to all of theme parks and Disney Springs, which makes the wait feel faster. Disney Springs also offers tons of shopping options. 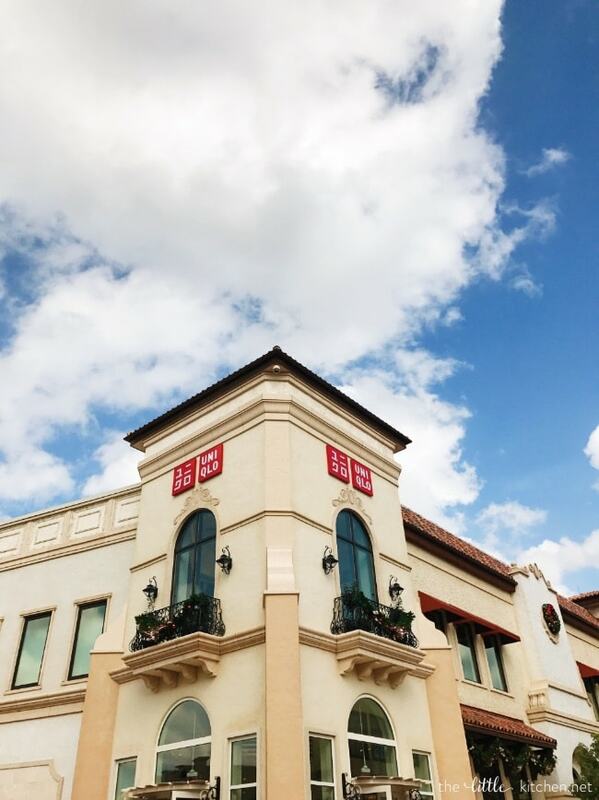 It’s pretty epic from the Star Wars Galactic Outpost to different brands you don’t see anywhere else in Central Florida like UNIQLO and Superdry. Another favorite of ours is the World of Disney store. It’s the largest Disney store in the US with twelve rooms! They have everything from jewelry to Disney-exclusive purses to toys, and even kitchenware. 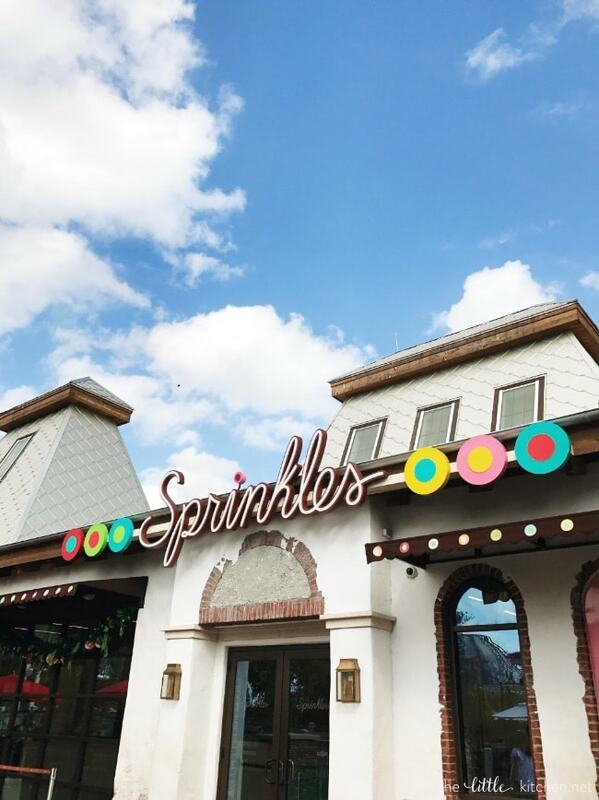 Disney Springs also has many dessert options such as, Sprinkles cupcake bakery, gelato at the authentic gelatoria, Vivoli Il Gelato and the newest addition Amorette’s Patisserie. You can’t go wrong with any of these sweet treats. What a great weekend it was! After this trip, we have so many great memories at Disney Springs that we will treasure. You are missing out if you don’t explore Disney Springs for the food and shopping. I’ll say it again, when you plan your next trip to Walt Disney World, you need to include some time checking out Disney Springs. 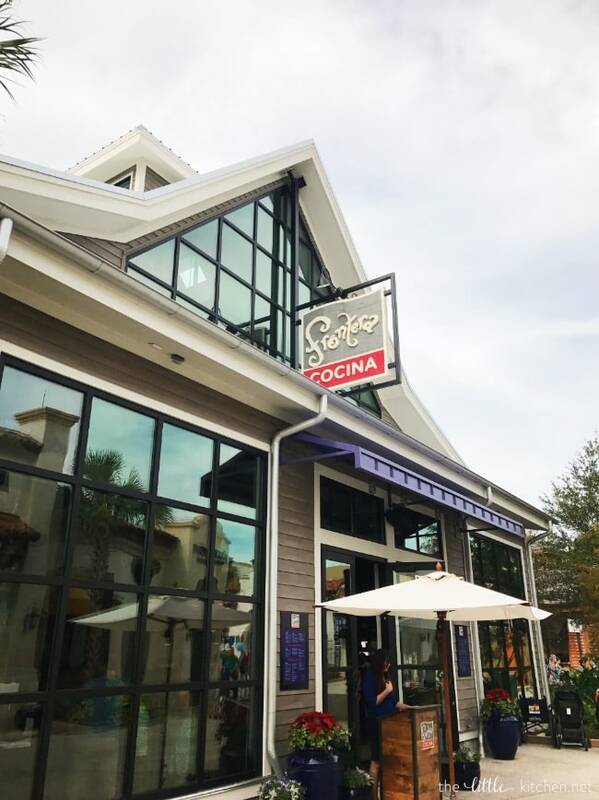 Have you been to Disney Springs before? What’s your favorite place to eat there? If you haven’t been, are you going soon? Disclosure: This post is sponsored by VISIT FLORIDA. I only share with you what I love and always share with you my own opinions. This is such an informative and thoughtful post. 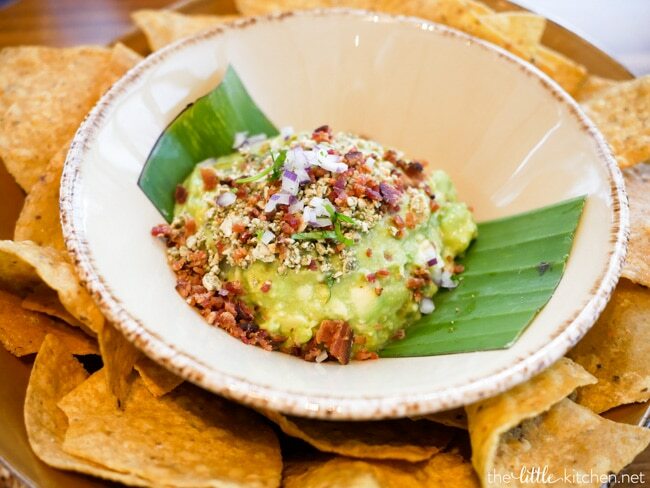 I love SO many of the restaurants you listed and can’t wait to try Frontera in DS! The food looked incredible! I always enjoy eating in Disney Springs! Love the new Disney Springs and all the new food offerings. We’ve been to Morimotto’s and sprinkles a few times! Still need to get to Art Smith’s and Frontera asap! I’ve heard nothing but great things about them both! We were just there! I also loved the shrimp from Frontera Cocina, it was delish! We also enjoyed using the Sprinkles ATM. Can’t wait until our next visit!!! Hi Julie, I found your site through Pinterest. Thanks for the helpful review. My family and I were in Disney a couple years back…wish I had a restaurant review like this before we went. The food looks amazing! Will have to keep these places in mind for next time. Cheers! Remind me next time I’ll be at Disney Springs I need to eat my way through WITH YOU! 🙂 Love the tube of homemade nutella and you can actually get portobello fries at Trader Joe’s! (frozen section) They’re really good – so I can only imagine how great there were there! wow. last time i was at wdw was 5+ years ago, and it seems like a return trip is needed asap! esp because disneyland’s downtown isn’t quite as abundant, at least not celeb chef wise (and there’s that sounds even remotely as good as the food you had at morimoto’s! ).